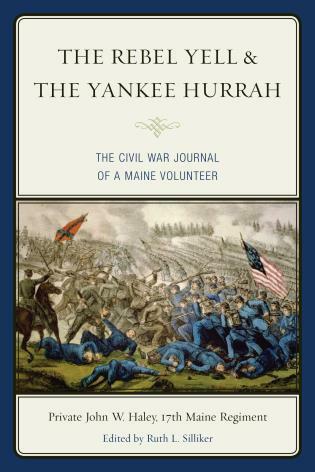 On an "I will if you will" dare, John Haley enlisted in the 17th Maine Regiment in August 1862 "for three years, unless sooner discharged." ("Discharged, shot, or starved" would have been more accurate, Haley later wryly observed.) Though a reluctant soldier at first, he served steadfastly in the Army of the Potomac for nearly three years, participating in some of the most significant battles of the Civil War. John Haley was not the only soldier to record each day's events in his journal by firelight or by picket's lantern, for his was a literate generation. He was unusual in that he later painstakingly rewrote his battlefield notes, "reflecting at leisure" and adding fascinating political and personal commentary to produce the remarkable volume he calls Haley's Chronicles. Freelance writer Ruth Silliker lives in Saco, Maine with her husband. She unearthed John Haley's chronicles in 1981, while researching another project at Saco's Dyer Library, and she was so taken with her discovery that she put aside her other writing pursuits in order to devote all her time and energy to editing this memoir.